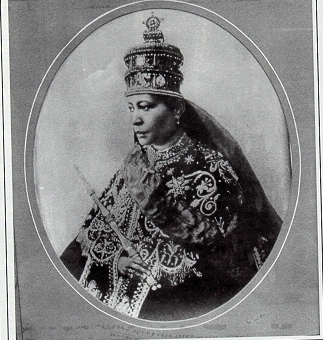 Empress Zewditu of Ethiopia was born on April 29, 1876 as Askala Maryam in the city of Harrar in Enjersa Goro Province, Ethiopia. Her mother was Abechi, a Shewan noblewoman and her father was Menelik II, at that point the king of Shewa and the future emperor of Ethiopia. Stuart Munro-Hay, Ethiopia, The Unknown Land: A Cultural and Historical Guide (London and New York: St. Martin’s Press, 2002); Chris Poutry and Eugene Rosenfeld, Historical Dictionary of Ethiopia and Eritrea (Metuchen, N.J.: Scarecrow Press, 1994); Saheed A. Adejumobi, The History of Ethiopia (Westport, Connecticut: Greenwood Press, 2007).